Cool minis for MourneQuest and more! Grab a discounted copy of MourneQuest now its Funded! We were delighted when MOURNEQUEST Successfully funded on Kickstarter on 8th June. 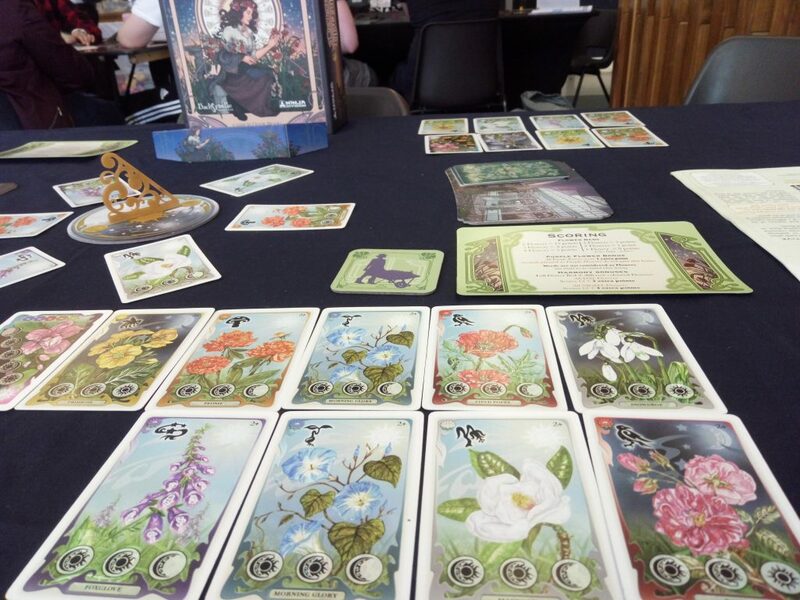 Thank you to all the backers who helped make this Irish fantasy book to boardgame a reality. To try and get some of the Stretch Goals we missed last week we put a post-Kickstarter campaign on Indiegogo. It is only LIVE for one more week. So, if you missed our successful Kickstarter and would like to get a copy of our very pretty game, please order it as soon as possible. Also please tell your friends about it using Social Media, word of mouth etc. and help unlock the cool Stretch Goal minis for backers of both campaigns. Click on the image above to go to the order page. Our BIG NEWS new release for Spiel 2018 is Ninja Squad! 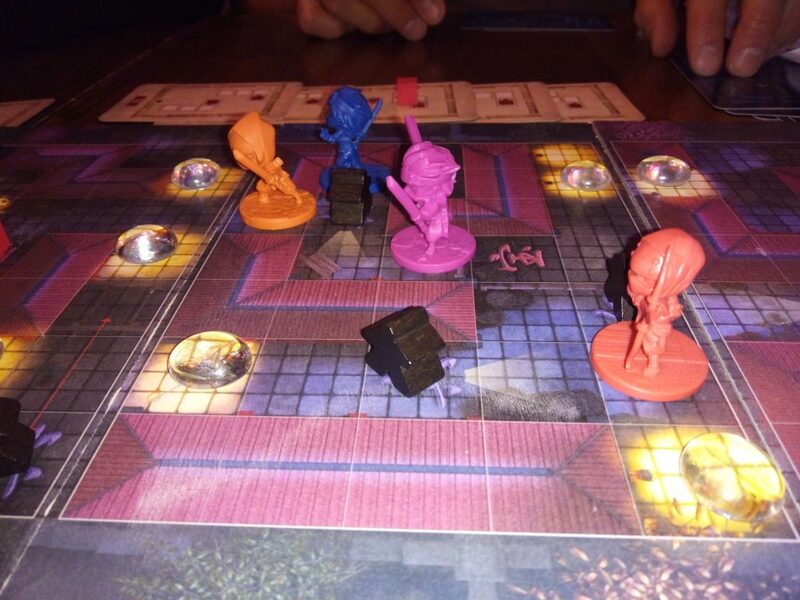 It’s a two to four player cooperative and also competitive boardgame, were players play the part of Ninjas leading from roof to roof while trying to evade the Shogun’s Guards. A bit like the Snickers TV add in the cooperative game and then on the player versus game, its every Ninja for themselves out through the Imperial Gardens. 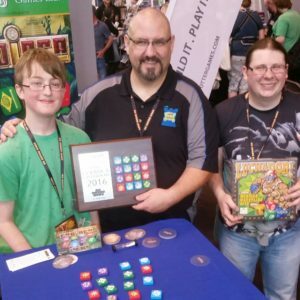 It, like MourneQuest, was loved at the UK Games Expo and last weekend at Q-Con, Belfast. 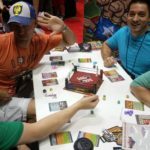 Backspindle boy David will have copies of both games at Gen Con and may possibly be able to demo Ninja Squad for a few fans. If you’d us to try and fit this in, drop an email to info@backspindlegames.com We can’t promise, but we will try our best. David will from time to time be at the Ninja Division booth – 2627. 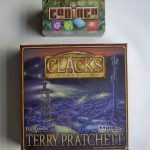 Discworld Clacks has sold out! However, we are expecting more stock in the next few weeks. 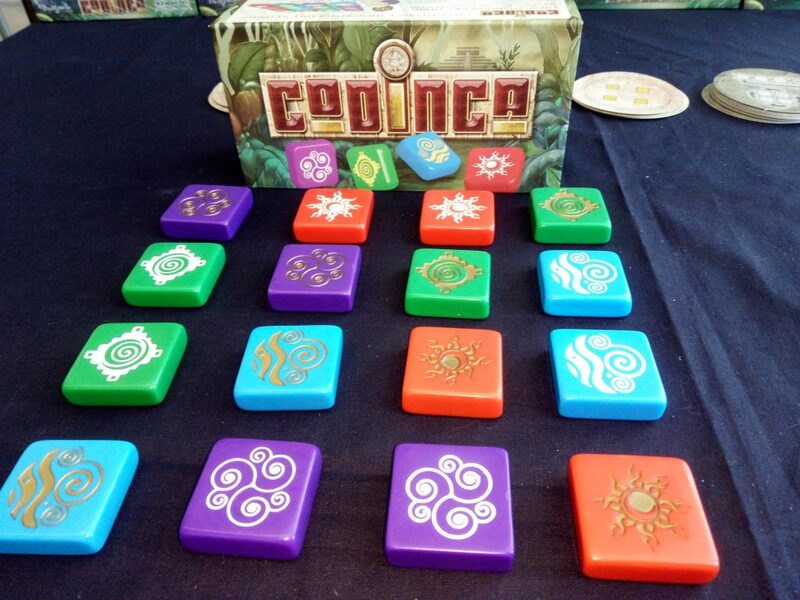 Codinca continues to sell well around the world and in our opinion is a ‘must have’ travel game for the summer months. 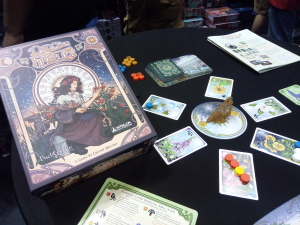 Dance of the Fireflies was also very popular at the UK Games Expo and can be ordered here. and finally Luchador! Mexican Wrestling Dice is still the best fun dice chucking game! 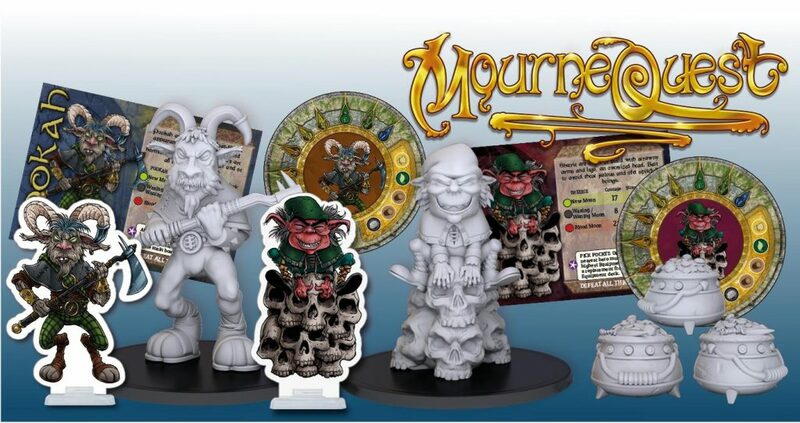 MourneQuest is Funding on Kickstarter! It finally has happened. MourneQuest is Funding on Kickstarter! We are delighted so far with all the support we have had for our MourneQuest campaign which launched on Kickstarter on 22 March. We very much appreciate the support of all backers that are helping make this dream a reality. At the time of writing the over $30K of the $39K funding goal has been pledged. There are still 16 days left in the campaign and we still need your help to spread the word and help us get over the finish line. Here are a selection of images we have released during the campaign. At this time we would like to thank the fantastic creative talents of John Farrelly (character creation) and Alan Perry (digital colourng & 3D sculpts). They have succeeded in bringing to life the mythical Irish characters and creatures from Garry McElherron’s teen novel. Not only are the illustrations superb, but the miniatures when painted, are very impressive. One could ‘nearly believe’ they were around in Ireland at some time. Special Free to enter #competitions for non-backers & backers. Win a copy of #MourneQuest ! 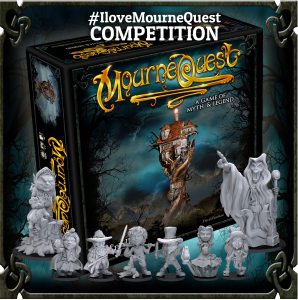 Simply ‘Share’ the #IloveMourneQuest post on our Facebook page with your friends or Retweet the #IloveMourneQuest tweet on our Twitter page for a chance to win! If you do both, you have two chances to win. Competition ends 12 midnight 1 April GMT. Full competition details on KS update. Good luck everyone and thank you for supporting us on what we hope will be a magical journey. Dance of the Fireflies released! Christmas combo bargain stocking-fillers! MourneQuest News! Dance of the Fireflies released! One of the prettiest, fun strategy games you can buy this Christmas! We have just released our new Dance of the Fireflies card game. 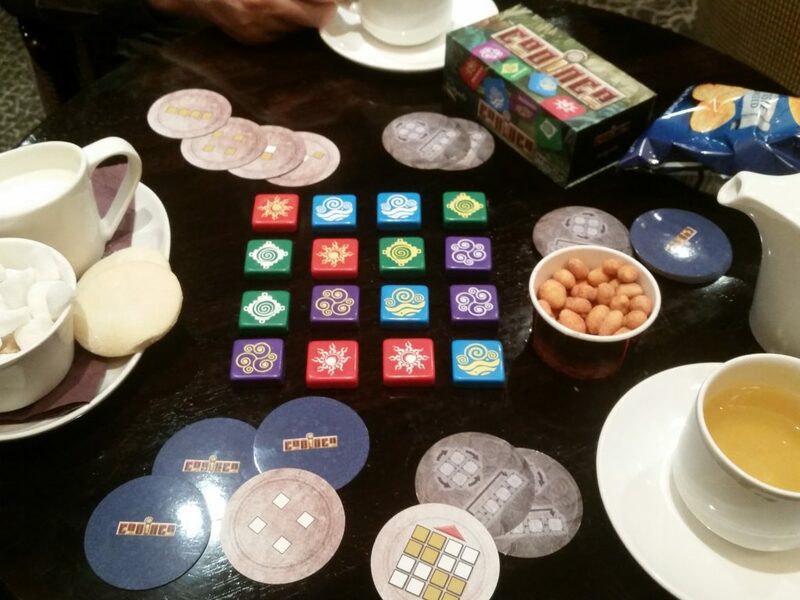 It is a perfect 2 – 6 player #familygame for game nights, or a filler-game with coffee. Designer Oliver Brooks was delighted with the polished product. 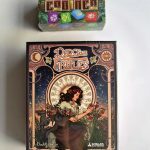 To celebrate our acclaimed pocket size simple 2 – 4 player strategy game Codinca, now selling in Barnes & Noble stores across the US we have created special Christmas Combo bargains, so you can pick up any one of our other hit games and a stocking-filler size copy of Codinca at very special discounted prices. UK Customers – 20 December. EU Customers – 15 December. ROW Customers – 9 December. We always aim for next day dispatch. If you require a Special Delivery Service, please email info@backspindlegames.com before ordering. We will then email you a Paypal invoice. 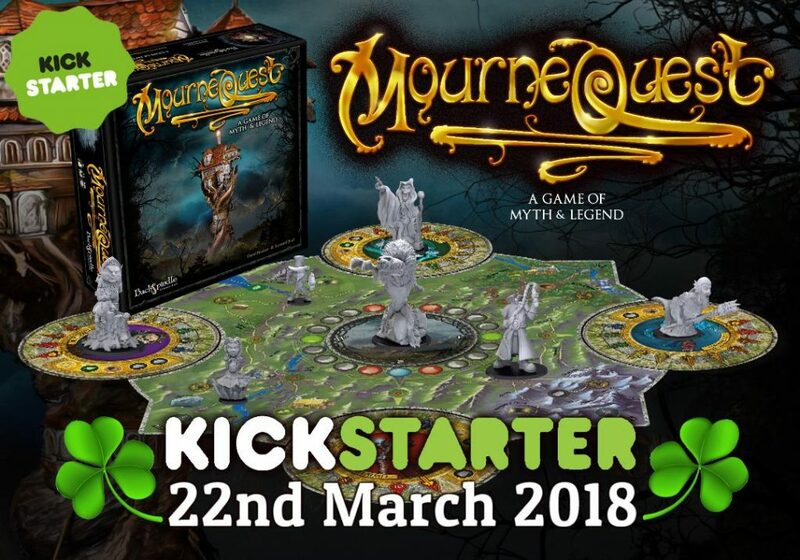 We are delighted to confirm our 2-4 player fun cooperative boardgame, MourneQuest, based on the Irish fantasy novel by Garry McElherron will go live on Kickstarter in early 2018. Artwork is completed, play-testing has been done, 3D miniatures have been created. We just have to decide on stretch goals and kickstarter specials. 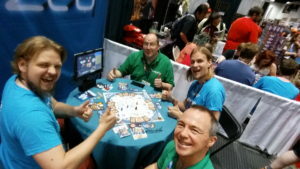 The game was reviewed by a number of industry influencers at both Gen Con and Spiel, and was greatly admired. Peace and friendly gaming to everyone during the holiday season. 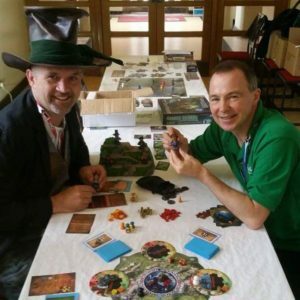 This weekend 2-4 June is the fantastic UK Games Expo in Birmingham. 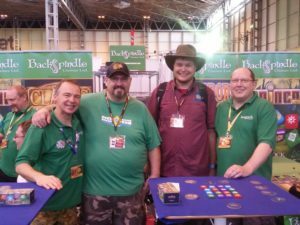 The biggest boardgame event in the UK. 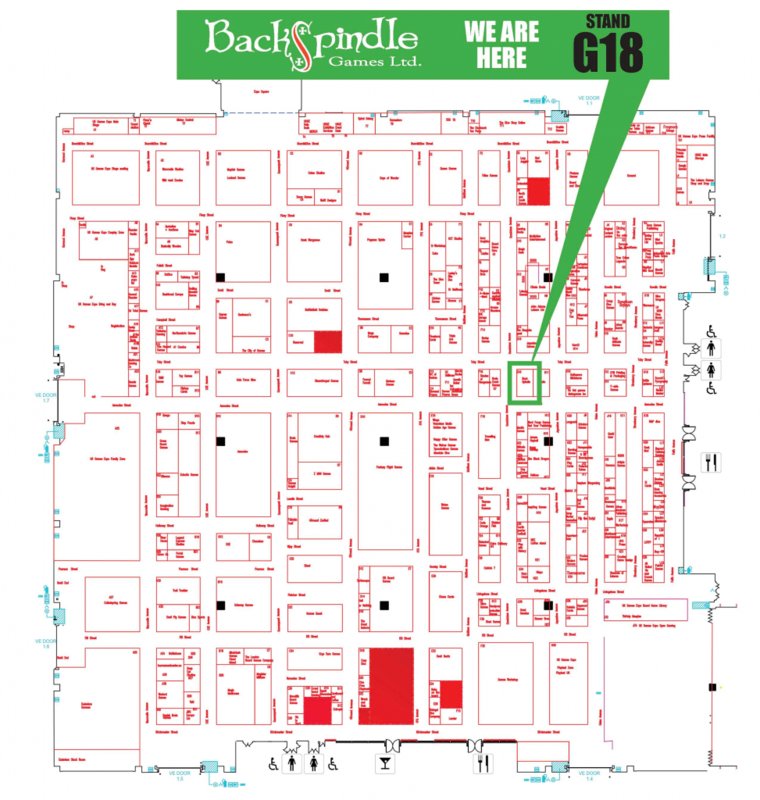 Each year for the last six years Backspindle Games have brought lots of fun and games to the Expo. It has got bigger and better, and so have we! This weekend we have two new game exclusives for you to try at our booth. The first is a 2-6 player strategy game called Dance of the Fireflies by designer Oliver Brooks. We’ll have to say it is a beautiful game, definitely the prettiest we have ever published. Players are each allocated seven Fireflies. Then they try to out-bid, out-manoeuvre their opponents to create the most beautiful flower beds and win the prize job of Head Gardener. 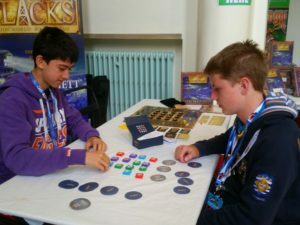 If you’d like to meet him, the game designer Oliver, will hopefully be at our booth on Saturday and Sunday afternoon. The game is due for worldwide release at Spiel, Essen in October 2017 and is going to print shortly. You can pre-order your own copy here. 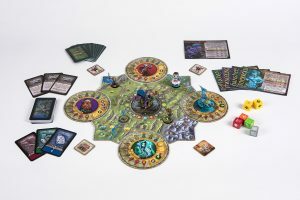 The second game, MourneQuest, is a 2 – 4 player cooperative boardgame, based on the fantasy teen novel of the same name by Garry McElherron. It’s due to be launched on Kickstarter in July 2017 and is packed full of Irish Mythical creature and character miniatures. Players have to work together to stop the Nightmares being released and then prepare themselves as best they can to face the old War Dog, The Shimnavore, in a final battle. To do this they have to collect resources, legendary artefacts and deal with the pesky Bogbeans. 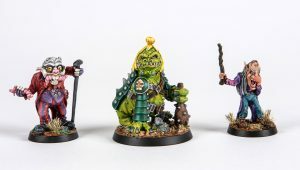 Each player is represented by a uniquely sculpted character miniature, each with their own special skill and can add to their powers by collecting legendary artefacts. But beware, if they spend too much time looking for artefacts, the Nightmares will be released. If you wish to be added to our newsletter for more information prior to the Kickstarter you can sign-up here. LUCHA UNDERGROUND PRIZES TO BE WON! We are delighted to be h osting a Luchador! Mexican Wrestling Dice Tag-Team Tournament at our booth on the ‘Friday morning from 11am’ Cool prizes from US TV Wrestling Show Lucha Underground are up for grabs. You need to sign up your Tag-Team name here to join the fun. It will be a fast & furious fun tournament. Winners take all! Players are encouraged to wear Luchador Costumes (Cos-Play) and masks to add to the spectacle. (Entries limited to 16 teams). You can find all of this and the charming Team Backspindle at Booth G18. It’s been coming….and now, it’s really happening! We have teamed up with Happy Shops in Germany so they can produce a German language translation add-on pack for Luchador! totally compatibly with our game. 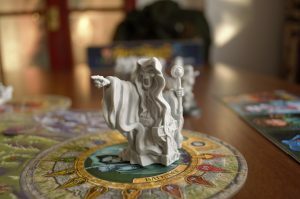 It’s on a German crowd-funding website called Spieleschmiede from NOW until 20 September 2016. Here is the link to the Spieleschmiede page. We came, we saw, we……did a lot of playing games! 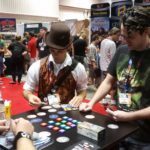 Our first Backspindle Games at Gen Con. Where exactly do we start? It feels like an Oscar acceptance speech…we were made feel SO SPECIAL. Our thanks goes out to everyone in Ninja Division for looking out for us, demoing our games and hanging out with us. The gamers that we met, played our games and demoed their ideas to us, the traders, the media and podcasters, the Dice Tower team, everyone we traded games with, all of you made it a fantastic event. We are in your gratitude. 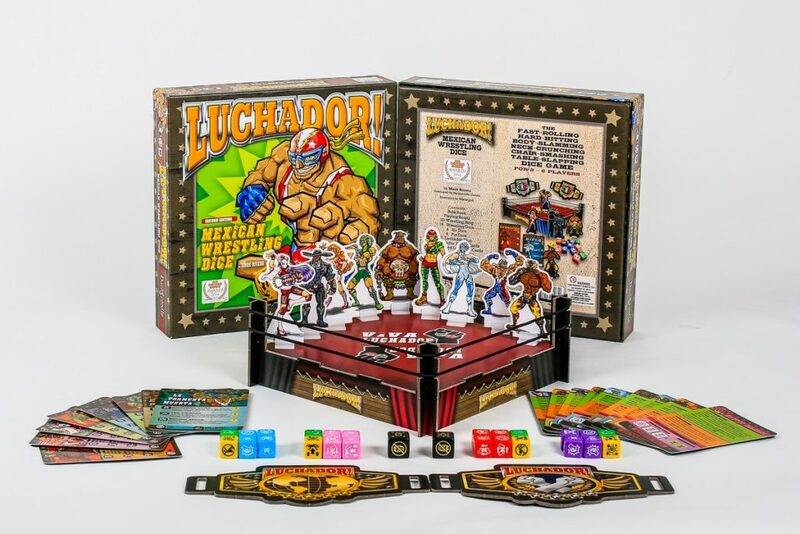 seeing so many gamers getting excited about Luchador! Mexican Wrestling Dice, Codinca and Guards! Guards! Indeed the action may have spilled over into the Convention…. 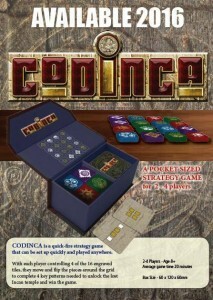 As you read above, Codinca was loved at Gen Con and is now back in stock, as are Clacks and Luchador. They can all be ordered from our website for shipping around the world or pre-ordered for collection from us at Spiel, Essen. We are at Hall 1, Booth 148. Just a reminder you too can be part of our story, bag a few free games, mix with the Backspindle gang at events, be part of our play-test team and more. Not only that, but you will also get first notice of some of the games we are planning for 2017. We still have a couple of spaces on our Spiel, Essen team and will have to get t-shirts printed accordingly. Interested? Here is the link to all the info. As of today we launch Team Backspindle, it’s your chance to be part of our story, bag a few free games, mix with the Backspindle gang at events, be part of our play-test team and more. Interested in joining Team Backspindle? All of the information is available here. Applicants will be contacted within two weeks of receiving their application form. We are very excited about this and hopefully some of you will be too. It’s really happening! 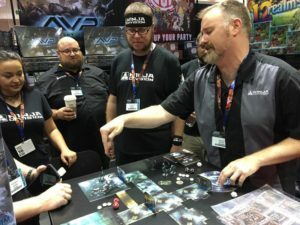 Backspindle Games is going to be at Gen Con from 4 – 7 August as guests of our North American strategic partner, Ninja Division. 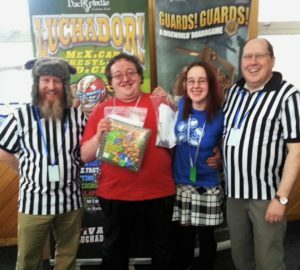 David & Leonard will be demoing games, refereeing Luchador! 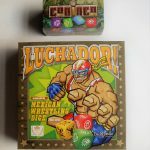 Mexican Wrestling dice matches at Booth 2814 on Thursday and Saturday afternoon and Friday morning. They will also be play-testing a few new games we have been working on and are available for interviews during their down-time. Once upon a time a big ship holding a container of much sought after Codinca games, left a port in China. Once out into the vast ocean the poor ship was hit by a typhoon. Thankfully the ship, and the Codinca games survived, but missed their Suez Canal passage slot, missed their birthing slot at Southampton in England and subsequently got diverted to a port in Belgium. Happily, the Codinca games then got transferred to another ship and are now on their way back to the UK. We hope to post them out to the latest pre-order customers by 29 July. If we do not have them we will make sure they go out immediately after Gen Con. Copies can be ordered here. The last ever print-run of Guards! Guards! games is diminishing. We still have a few Clacks and Luchador available. You can purchase them from our website. 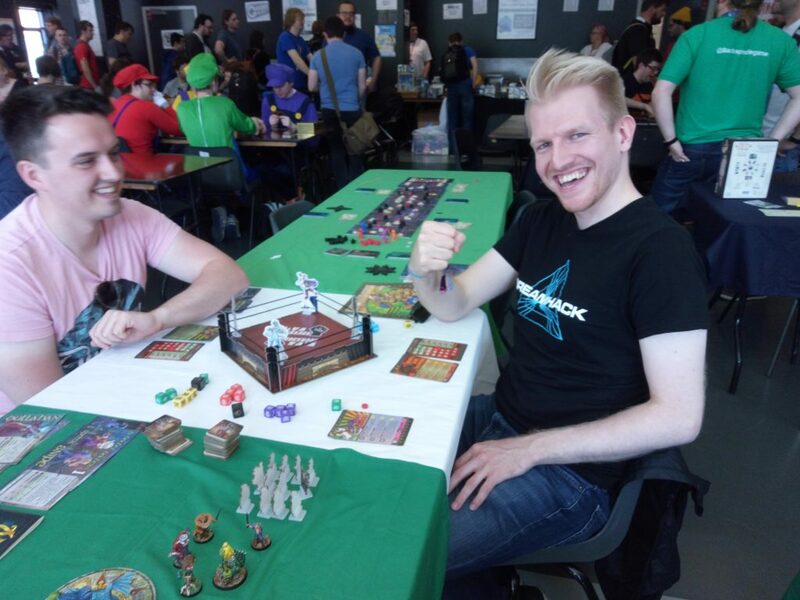 Last month we were delighted once again to be invited to the biggest gaming convention in Northern Ireland, Q-Con. All we can say is, it was the best ever! We had a great location, a willing crowd of players both for our existing games and ready to play-test new game ideas we are considering for publication. 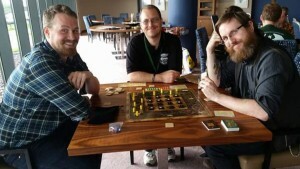 Gamers got a sneak peak of the new Mourne Quest game we have been working on with author Garry McElherron. 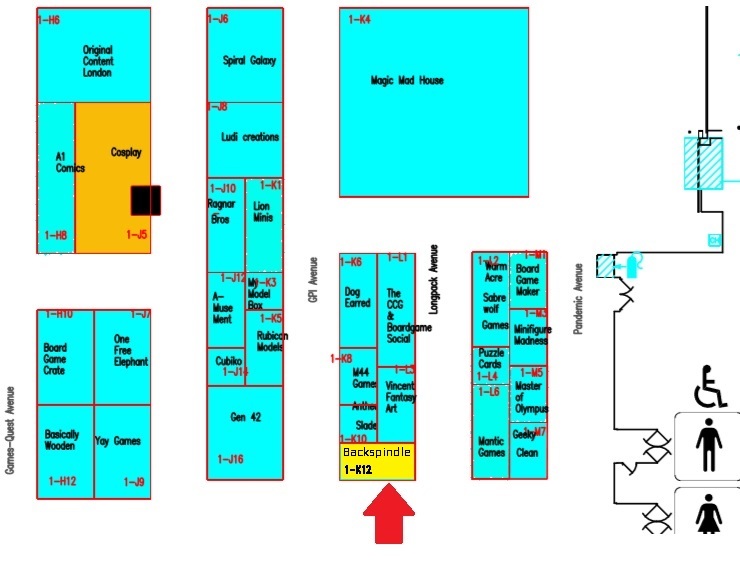 We are delighted to advise this year we will be sharing our booth, F-148 at Spiel, Essen with Spiral Galaxy Games. They will be releasing their new game, Mythos Tales, a cooperative investigating game set in HP Lovecraft’s Arkham. The pre-order is live! Codinca can be yours first! Why are we so excited about this? Well, back in 2012 when we published the original limited edition version for Spiel, Essen the game had already been shortlisted for the Award of Best New Abstract Game by the judges at the UK Games Expo. Although it narrowly missed out we knew we had potentially a ‘very good’ game on our hands. Following more play-testing over the last year, we have simplified and cleaned up the mechanics of the game and we feel it’s even better! 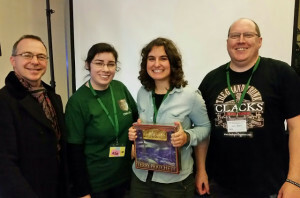 Its official release if fittingly going to be at the 2016 UK Games Expo in Birmingham on 3-5 June 2016, where not only can you play the game, but you can enter the first ever British Speed Codinca Championships here and win a signed copy of the game, a copy of Clacks! and a fantastic Codinca trophy. Games can be pre-ordered here for collection at UK Games Expo (Booth – F7) or if you can’t make it there, copies are due for dispatch on week commencing 20 June 2016, if not before. We are delighted to announce Ninja Division Publishing as our new strategic partner for the USA. Our range of games will now be available through Ninja Division Publishing alongside their incredibly successful products including Super Dungeon Explore, Ninja All-Stars, Relic Knights, Alien v Predator, Raid & Trade, 12 Realms, and DrunkQuest. We also aim to work closely with Ninja Division on future projects. 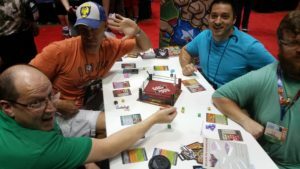 Some of you may know Mark Rivera as Blighty Gamer, the game reviewer, others may know him as the designer of award winning Luchador! 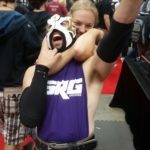 Mexican Wrestling Dice and co-designer of Ace of Spies, well now you know him as an official member of Backspindle Games. We are super pleased Mark has joined us. He will have responsibilities in social media and marketing, new game concepts and development and of course working on the next expansion of Luchador! Here he is with our Creative Director, Leonard Boyd getting down to the business of game design. Sadly, even though we ordered extra copies of Guards! Guards! for the final print-run ever we are starting to run out. Copies can still be acquired here before it becomes a collectors item and people are trying to sell it a over inflated prices. Clacks! has also been very popular. We have some copies here and can also let you know that we are shortly going to reprint and in addition are printing in Polish, with Phalanx and in Czech with Rexport. Yup we’re moving with the times, picture by picture and video by video. You can now find us at Instagram and YouTube. Phew, we know it took a while, but we finally got there…. You can read our ‘designers diary’ here. 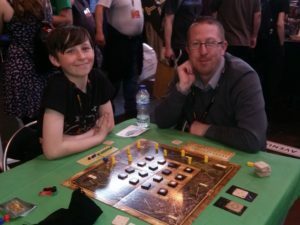 The game Pat ‘The Duck Man’ Harkin told us in 2012 he could imagine kids in the streets of Ankh-Morpork playing it with bottle tops, had its official release at the Irish Discworld Convention in Cork on Saturday 3 October. We had a short presentation, a few live audience games and finally a live ‘late night poker’ style match, complete with overhead camera (many thanks Tech) in which two delegates got to challenge Pat Harkin, with the final winner being Milena Milojicic. Clacks illustrator, Amber ‘Nudge’ Grundy was on hand to present and sign a special copy for Milena. It was great catching up with everyone; especially Colin Smythe and all the gang from the Discworld Emporium. Happily Ian managed to find time for a game of Clacks too. The pre-orders from our website have started the shipping process and all should be completed by Friday 23 October. Strewth, back from the IDWCon on Sunday night and on a plane to Essen Germany for the biggest board game convention in the world on Wednesday morning. Oh the life of game publishers…demanding. None the less we did it; a complete four man squad of Backspindle Boys to demo, sell, have meetings, mingle and have loads and loads of fun for four of the craziest days of gaming ever. We also had help which we really appreciate from a lovely German chap called Tobias. Bottom line, everybody loved our games; copies of Guards! Guards! were snapped up, (we guess many gamers do not want to miss it before the final print-run is exhausted), Luchador! 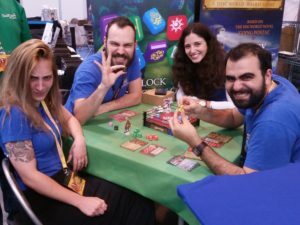 the crazy fun wrestling dice game, was once again the loudest game at Spiel (check out this video clip – Luchador! dice fun) and finally Clacks, oh goodness, how the gamers at Spiel loved playing the cooperative race game against the Post Office. Some comments were “It’s so simple, yet challenging” and “We love the way you have to try hard to beat the Post Office in the cooperative race.” Spiel was simply fantastic! In addition to our games at Spiel, the same week Masqueoca took delivery of the first ever Spanish language editions of Luchador! Mexican Wrestling Dice. A ‘Luchador body’ t-shirt. All you need now is your mask. We also sold a few of our really quirky new Luchador! T-shirts. You can order yours here. 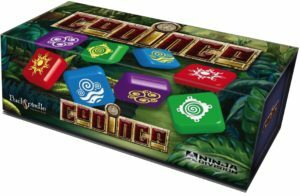 In preparation for our release of Pocket Codinca for 2016 we also let a few large gaming companies try the simplified rules. They thought it was great too! Here is a mock-up of what it will look a bit like. 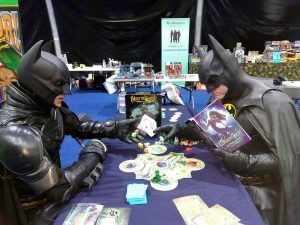 We are delighted to be supporting Wee Gamers at Heroes and Legends, Eikon Exhibition Centre, Lisburn on 24 & 25 October and again at Belfast Film and Comic Con, SSE Arena, Belfast on 31 October and 1 November.